Many years ago, someone predicted that Email will be dead soon, he was clearly wrong, as many years later, Email is absolutely still the No.1 communication tool for most amount us. In fact being a tool that is so frequently used, we really shouldn’t overlook it’s power, if an ordinary daily email is used properly, it can also be an effective marketing and sales tool that drives great results. But first of all, you need to make sure it looks at least professional if not attractive. We are not going to talk about email marketing, the email subject line or the copy. We talk about something comes the last in order, it’s about how to make your email signature looks great and functional also, without spending a penny on it. There are many email signature creation platforms available online, which can help to achieve so, but unfortunately, most of them are not free. I agree with their creators that an email signature does matter, and there is certainly a huge market for it, but I don’t understand why they want people to pay a monthly installment for an email signature… It doesn’t sound right to me. To be honest, this is not a rocket science at all. Talking about a freebie, of course, you can create a basic signature from any email client application, they may look like this. Watch the video demo below to see how it works. After inputting all the info necessary, you can copy and paste it in your own email application. This supposed to support nearly all the email provider such as Gmail, Outlook, Yahoo Mail, Apple Mail, etc. For advanced users, who understand HTML coding, they can choose using the advanced mode by copying the code generated by the tool, I believe this will enable you to create your own based upon. There is an interesting thing. After creating this signature, I’ve realised that the HubSpot tool has an even greater value than just creating an email signature if you are like me, use video content as a part of the marketing strategy. In video marketing, producing a video is actually only the beginning of a journey, it’s very much like building a website is the begging of a online presents, it never ends there. As video marketing content creators, we take a lot of efforts in the video distribution strategy. Basically, we take any opportunity to push the videos we’ve created out of the world, because no matter how brilliant the videos are, they got to be seen by your targeted audience, otherwise means Failure. So why don’t we take advantage of this most used communication tool to show off your well created video content? 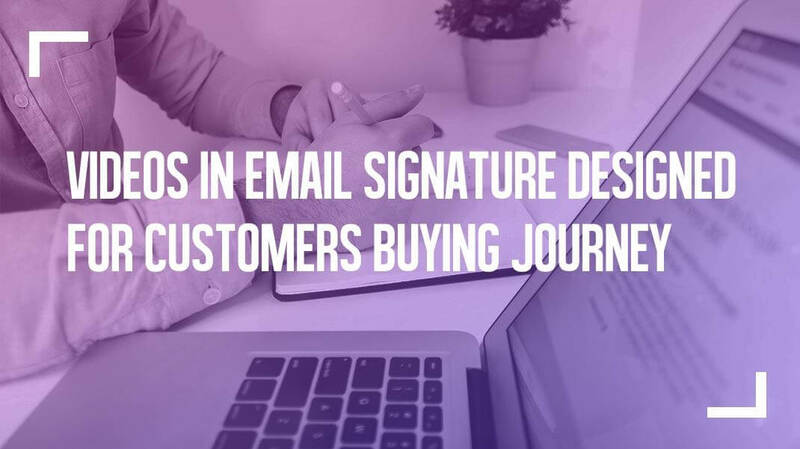 The CAT section in the HubSpot signature creator is hugely valuable to people because you can easily use this function to create an email signature with a video embedded that engage with your clients or potential customers. It can be a personalised self-intro video, or it can be a sales video, or it can also be a general company profile video, you can use any type of video you like depending on what you do, who you are, who you are writing to. We have tested in the past, the video in an email signature generated 8x more engagement rate than the ones, which were embedded on the client’s website alone! Which basically means, 8 times return on investment if you do care about the ROI. Also, instead of having only one signature to suit all, why don’t we create a whole set to suit different coordinators, who might be on the different stage of their buying journey? Watch the demo showing how to use HubSpot signature Creator to add video to your signature. So this is the post about how to use HubSpot Signature Creator to make your own professional email signature, and the best part of it is, you can use video embedded signature to boost your marketing results. It’s not really a major video marketing strategy, but I’ve found it really handy and effective in many cases. I will extend this reading by wrting another post about “How to engage with your customer using video email signature”. Hopefully, I will add some case study in as well. See you shortly.